Not long ago, I started to promote my blog on Facebook more seriously. Since the subject of my blog is not 100% appropriate for the audience present in these groups, I quickly wondered if the time invested in the promotion was worth it. Therefore, I started looking for a method to be able to track which Facebook groups brings me the most visitors! And I found an EASY way! Here’s what you’ll get after following the steps! Each Facebook group is listed on the left. 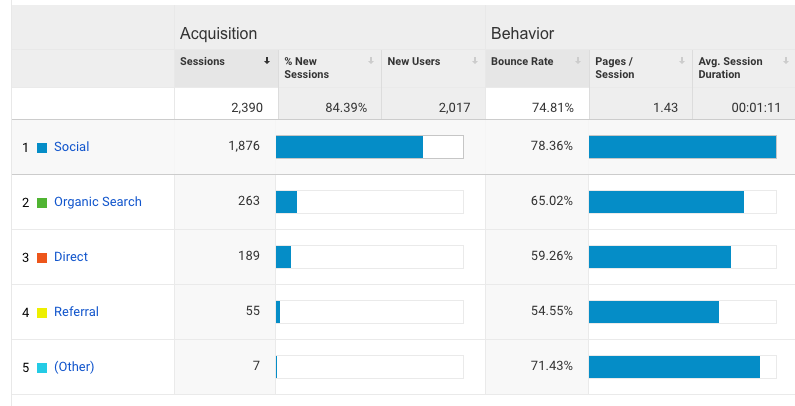 You can then see the number of sessions, new visitors, time spent on the page on average, etc. You will also be able to discover what articles visitors from Facebook groups viewed! Continue reading to learn more! There’s no point in wasting your time doing promotion on a group if you had only one visitor in the last 6 months. This lets you know which groups you need to concentrate on, or which ones you should work on. And also, let’s you know which articles are most popular on Facebook! Our source of Trafic in our case is Facebook. Our medium is “Social” since Facebook is a social media! Simple, right? I use this parameter to write the name of the Facebook group, since it’s the precision I need! Well, I guess you’re telling me that this is requiring too much work, right? Nope! Still just a little! To simplify your lives, I created an excel document for you. However, keep in mind that it is very important to be consistent and always use the same links for the same articles. Do not make variations in your UTM settings. That’s why I strongly advise you to document your links, as I do with my excel document. To get the Google Sheet, enter your email in the form below. You can use it to generate easily and efficiently your links. Note that the columns C, D and E are hidden. It’s the 3 columns that are automatically filling the UTM parameters that I explained to you earlier. These columns are hidden because you have to establish them once and for all at the beginning, and never edit them afterwards. I already did it for you, so you are already good to go! This Google Sheet will make it way easier for you to create your links! Go to your emails, click on the link to get the Google Sheet. The email might go in the promotion folder. Rename the document to what you want. The document will open in a new tab and you can start to edit it now! The column B contains the name of the Facebook group that I’m a member. Edit the link to write the ones you are a part of. Paste the link to your blog post in the cell A2. Slide the cell to the bottom until you have reach all the FB groups. In the column F, you will see the link that will be automatically generated. It’s the link that you need to use in Facebook groups. Only re-write between the quotation marks. Then, slide the text for all your Facebook groups! I highly recommend you to write a little sentence when you promote a post in groups. In my opinion, it is better to write a word presenting the article rather than simply writing its link in a comment and sending it coldly. This can make a difference and make people want to read your article. As I do not want to rewrite this small text every time I publish to a group, I write it for the first time in cell G2, then I slide the cursor to replicate the text for all other Facebook groups. The link is added to the end of the text automatically. Copy the range of rows you used for the last item. Paste it underneath. Change the background color of the cells so you can easily differentiate a new post. Change the link to the article in column A, then drag the slider down to repeat the change for all rows. Write the promotional text corresponding to the item in column G, and drag the cursor to reproduce the text for all of the following facebook groups. When you want to publish to a particular Facebook group, copy and paste the contents of column G. That’s it! If you find that the long URL to your blog is ugly, you can shorten it with tools like bit.ly. On the other hand, when you post your link in a comment on Facebook, only the “important” part is displayed. And if you post the link directly on the wall of a group, there is no obligation to leave the link visible, you can delete it from the text once the preview generated, so no problem on that side too. In short, I do not bother to shorten my links since they go unnoticed on Facebook, as you can see in the pictures below. It is suggested that you write the content of UTM parameters in lowercase. This is already done in my Excel file, but it also depends on what you use in your Analytics dashboard beforehand. If in the Acquisition > Overview tab your main channels (social, organic search, direct, etc) are lowercase, use lowercase letters. On the other hand, if it is written “Social” with the S in uppercase, use Social with an uppercase S in your UTM parameters. It is very important to use the same UTM settings once you start. I strongly suggest that you document your links and reuse them when you redo the promotion of an article on a Facebook group. If you change the settings along the way, this will cause inconsistent data, and you don’t want that! On Google Analytics, the historical data are untouchable and cannot be changed. I hope this article will help you know which Facebook groups work best for you. I’m not an expert on Google Analytics and advertising campaigns. On the other hand, I asked several people around me the best way to analyze his visitors, and my method seems the best! And it might not look like it, but I worked on this tracking method for MONTHS! Do not hesitate to leave a comment if you have any question or comment to make me. It will be my pleasure to help you! I’ve been doing the same thing during April and May, but I’m getting very different numbers! I think I should check out your top group. I think my audience overlaps with yours (I blog about science) so I would expect some similar results… How much time do you tend to invest in Facebook groups? I find some of the threads very time-consuming for very little return. For example, if you have to do ALL in a thread, takes forever. But on the other hand, if you choose X number to do, I found it’s only really worth it if you’re one of the first in the thread so people are more likely to pick you. By curiosity, were you using the same UTM parameters as me? 🙂 Boost Your Blog is the best one for me – for various posts. I am so passionate about blogging that it’s hard for me to tell how much time I spend on things, but I think I spend 15 minutes per day in average on FB Groups. What takes you a lot of time on these groups? I have to admit I never participate in the comment-for-comment thread or things like that because I just end up on Fashion blogs and I’m not the fashion type. Haha, I love your July experiment! On my part, I sometimes had to stop promoting on FB due to midterms for example. I saw a BIG decrease in my engagement. So much that it got me disappointed and I made a point to do that 15 minutes of promotion every day afterward. I had different parameters: I used “campaign” for the name of the blog post, “source” for facebook (that was the same – I also comoared with Twitter so they weren’t all “fb”), and “medium” for name of the group. Any threads take me a lot of time because I have to remember to go back to them and deal with them. Look forward to the Todoist post! Ah, I see! 🙂 Thanks for the info! Honestly, I have wondered how effective my posting in Facebook groups has been. Just curious, did you find that certain groups perform better than others? Or was it more dependent on which posts you shared and what you wrote with your post? For sure, certain groups are performing way better than others. You can just see at one of the first screenshots to see the difference in engagement. Also, the 1000+ in Boost Your Blog was achievable because I had one post, “How I Got 15K Followers on Instagram” that became insanely popular there – and on most Facebook groups too. I think you might be able to see which posts were the most popular in my video, towards the end. I also think that the number of likes and comments you get on a post when you publish directly on a wall of a group has a huge impact. Everytime someone comment, the post is brought back at the top of the group, so new people see it and comment – again and again! That is what happened with my Instagram post. That day was like paradise for me. Wow, this is amazing! Super detailed and useful- and I love that you also did a video tutorial. I just started paying more attention to promoting my blog on Fb lately as well, so this is really good! This is great. I have been wondering if all the FB groups are worth it. Thank-you for the information. I pinned it for when I have a little more time to deal with it. Thank you for pinning, I hope to see you back here soon!! Awesome! Tomorrow (Monday) I’ll publish a new blog post about how I schedule my promotion on Facebook Groups with Todoist, and in there, there are a lot of others FB Groups you can use. 🙂 I also have them listed on a blog post if you’re interested. Marie, I luv luv the step by steps on seeing the roi on particpating in groups, better yet how to do it with UTM and GA.
By anychance do you have any suggestion on why the Tag assistant is not firing on it’s own? Hi great post but I am not sure how to create the facebook groups on google analytics? You don’t have to create anything, the only thing you need to do is use the links with UTM parameters at the end to start analyzing your FB groups. So helpful! I can’t wait to give this a try! I’m so glad you found this blog post helpful!! Wow, this is so helpful!! I’ve been spending so much time participating in these groups lately, but with a premium on a working mom’s life (mine, ahem.) it’s so hard to figure out which are worth it! Thanks soooo much for this guide!! Thanks for this! I was wondering how to know what FB groups are worth my time. I pinned it so I can work on it when I have time. Thanks I would have never known this! Very helpful info. WHAT? This is awesome and exactly what I need to measure ROI of those Facebook group Promo Days. Thanks so much for sharing! I am having problems with the way that my links are showing up in the FB groups when I copy and paste from the g column. They are shown as a pic on the left side with the link info on the right and not with a big pretty picture on the top with the link info on the bottom like yours shows in the video. What is the difference and how can I get mine to look like yours? Do you have a picture I could see your problem? You could upload it to imgur for example! It’s difficult to imagine with your description… Maybe it’s the size of the image in that particular blog post? Does it happen with every single blog post you have? What a great post, I just started with Facebook Groups yesterday so thankfully I’m able to apply this strategy very early on in my Facebook Group use. I can’t wait to see how useful they are are individually, thanks to your blog post! you added a post title that grabbed a person’s attention? I mean How to analyze Facebook Groups visitors with Google Analytics – Girl Knows Tech is kinda boring. I completely agree that I need to compose catchier post titles. It’s one of the things I’m not good at. However, I remember brainstorming for hours on the title of this blog post, and asking friends for help. Please give me a suggestion of how you would name this blog post?